You spoke up, and Target listened. It was a mere nine months ago that Safer Chemicals, Healthy Families launched our Mind the Store campaign with the goal of working with, and moving the nation's leading retailers towards safer products. There has been a growing movement of parents, educators, physicians and scientists who are concerned about toxic chemicals found in the products we use everyday. Due to our antiquated federal laws on toxic chemicals, many of the products in our homes contain chemicals that have been linked to serious health effects like: infertility, early puberty, cancer and hormone disruption. In response to this growing body of science, many people are asking different questions about the products they buy and use. Individuals and organizations have been urging retailers to play a role in solving this toxic riddle. We are celebrating a victory because Target announced an impressive first step to address toxic chemicals in the supply chain. Summary of Target's "Sustainable Products Standard"
The standard works primarily as an incentive program for the manufacturers who sell in their store. Target will systematically rank their manufacturers on how they are doing in regards to chemicals, based on the criteria below. 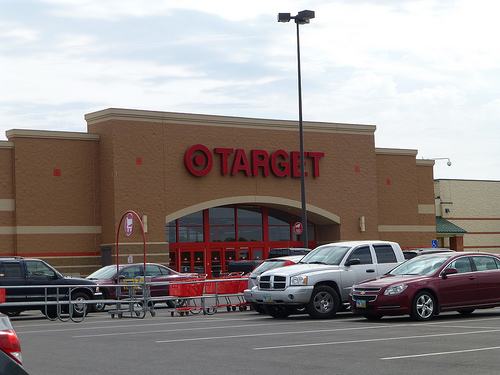 The manufacturers will be given a score, which will be used by Target's buyers (the people who decide what to sell in their store) and will help guide their purchasing decisions. 50 percent of the score goes to the ingredients used. In order to get the full points the manufacturer cannot use any of the 1,000 unique chemicals identified by the authoritative lists here. 20 percent of the score goes to transparency. This includes listing full ingredient list on product packaging or the manufacturers website. While not requiring manufacturers to do this, it is a large part of the score and will hopefully move the market towards more transparency and information for consumers. 20 percent of the score for sustainable packaging -- to receive the full points for this category the packaging must be recyclable to the majority of consumers, along with other criteria. 5 percent of the score to no animal testing. 5 percent of the score on having minimal impact on water quality -- to receive the full points, the product cannot contain any chemicals or ingredients that are toxic to the aquatic environment. The products ranked in this standard include: personal care, beauty, baby, and household cleaning. We are pleased to see that half of the score for the product ranking focuses on the ingredients used. We carefully developed a road map for retailers (called the Hazardous 100+ list) based on the leading authoritative lists on toxic chemicals. We are encouraged to see a strong overlap between the Target "red list" of chemicals to avoid and our Hazardous 100+ list. While we recognize that taking action on toxic chemicals from the retailer's perspective is not an easy task, we find a few areas for improvement for Target's Sustainable Products Standard. The score that product manufacturers receive as part of this standard is not available to the public. This ranking is primarily used as a business-to-business tool, but we recognize that currently the public has little to no access to information on chemicals in products, and are hungry for this kind of information. Target will be adding other product categories over time (good), but won't start to use this standard on cosmetics until 2014. Target hasn't publicly stated how they will measure success from this program. We would like to work with Target to create a public, long-term goal by which we can assess if the standard is moving products away from toxic ingredients. All in all, we think this is an important first step for Target in moving the market towards safer products. We applaud Target for creating this standard and look forward to working with them overtime to hone and expand this standard. For those of you who have been asking questions, signing petitions and calling manufacturers, it's working. The market is shifting away from toxic chemicals and towards a little bit more piece of mind.